Sam Fisher is out for blood. 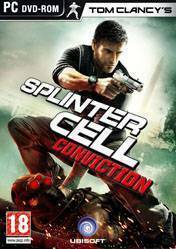 In Tom Clancy\'s Splinter Cell: Conviction, this normally cool cat has honed some extra-sharp edges, but that\'s what happens when you mess with a man\'s brood. At one point in the game, a voice-over tells us that the boorish brute is \"pure Sam, pure Sam when he\'s mad,\" but that simple explanation doesn\'t say the half of it. The franchise\'s gruff star is a changed man, and with Conviction, Splinter Cell is a changed series. This is not the challenging stealth purebred you\'d expect, but rather a more approachable kind of stealth-action mongrel. You still silently snoop about in the shadows, but features you\'d expect in a Splinter Cell game, and even in stealth games in general, simply aren\'t present. You can\'t move bodies out of plain sight, you don\'t pick locks, and you can\'t choose to knock your foes out--only kill them outright. Yet the new mark-and-execute feature helps make up for a bit of that lost spark by providing tense thrills of a different sort, and fantastic storytelling will keep you invested in the campaign. But if you really want to see Conviction at its best, you should grab a buddy and sneak your way through the shadows of the cooperative campaign.